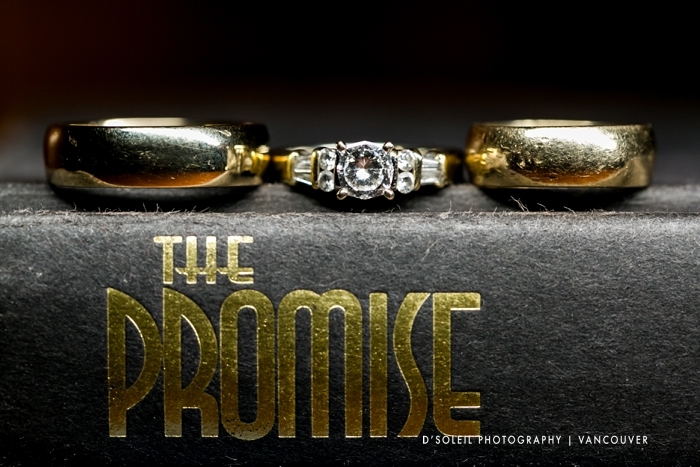 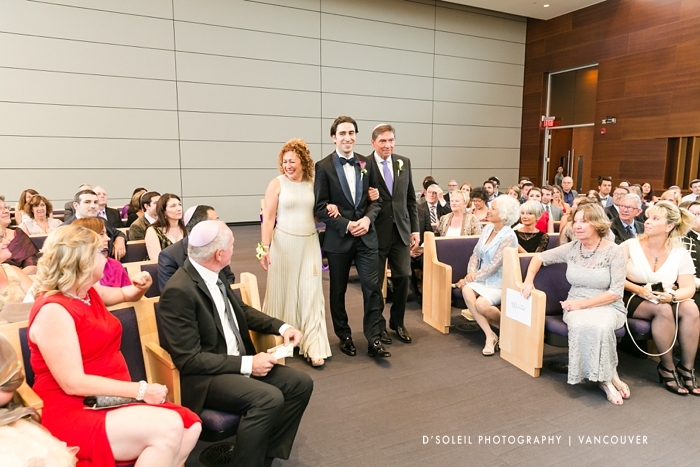 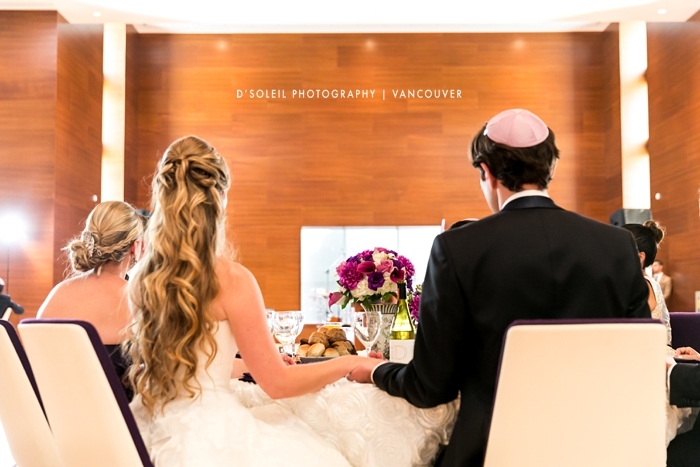 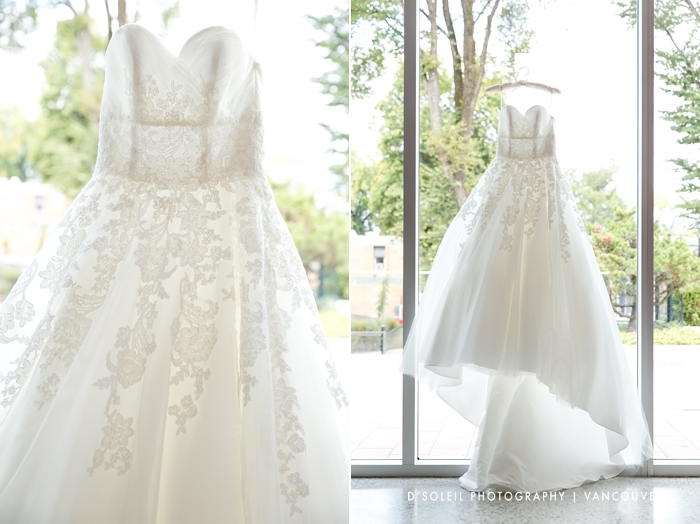 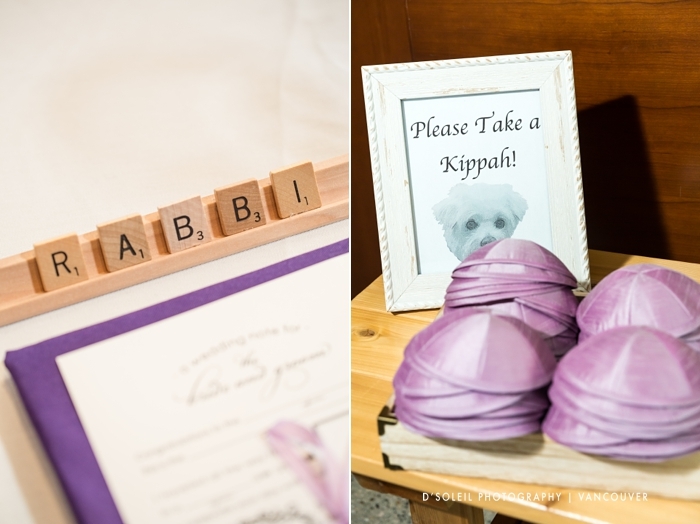 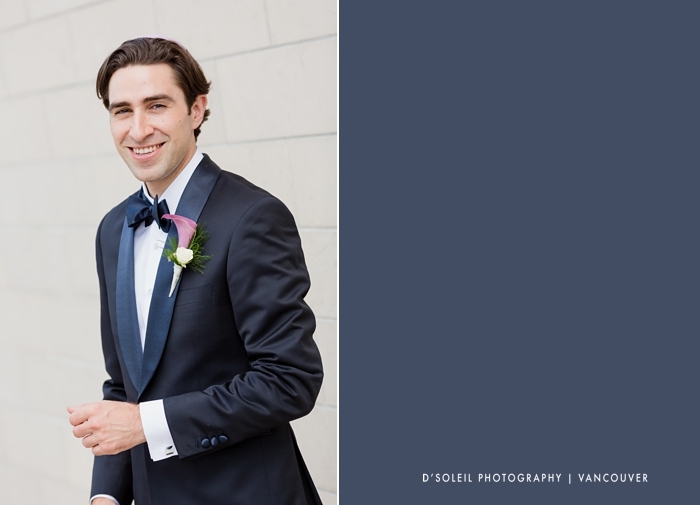 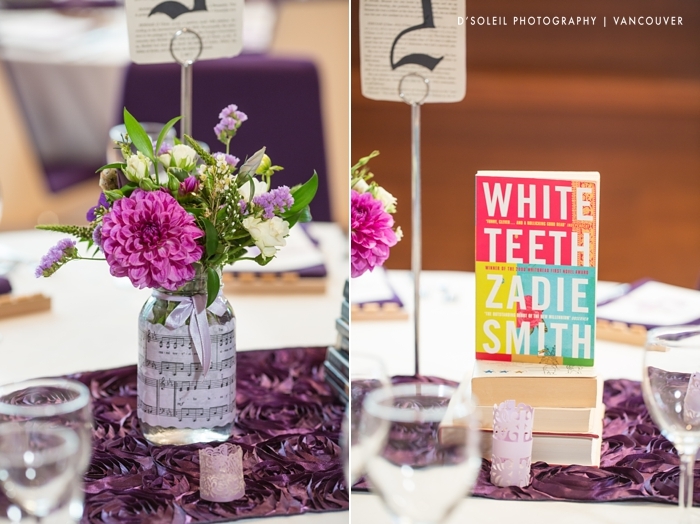 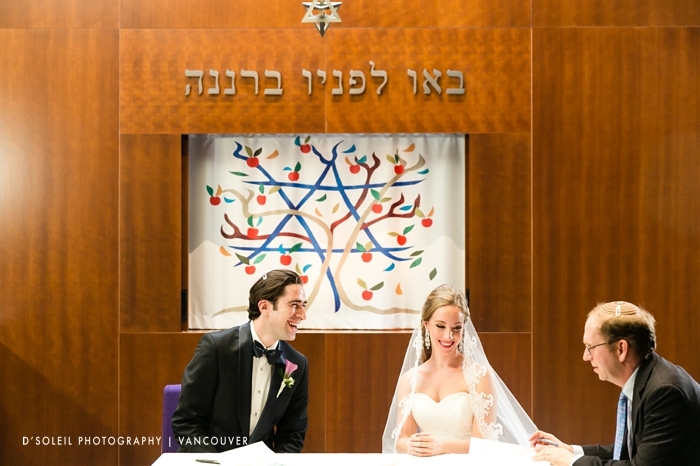 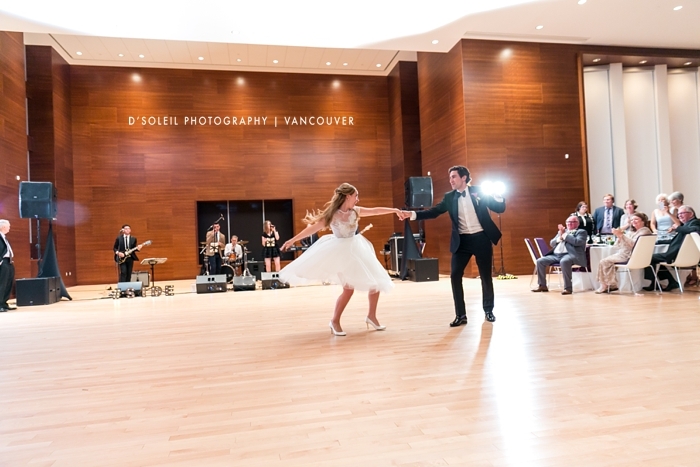 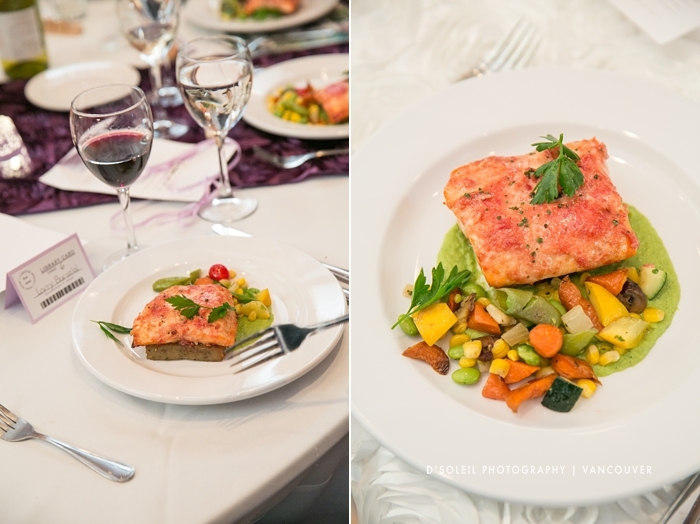 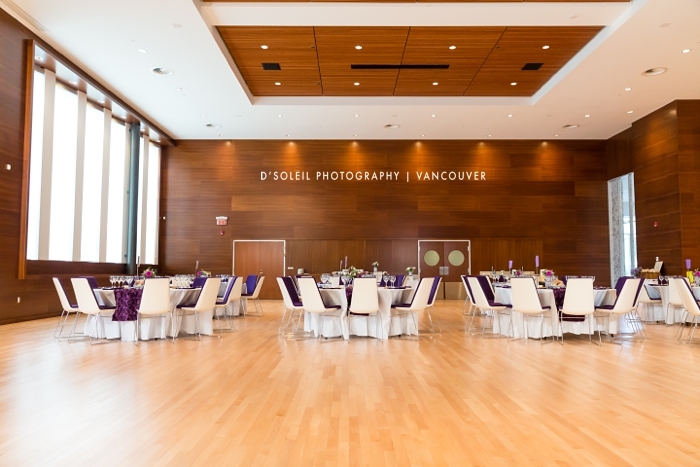 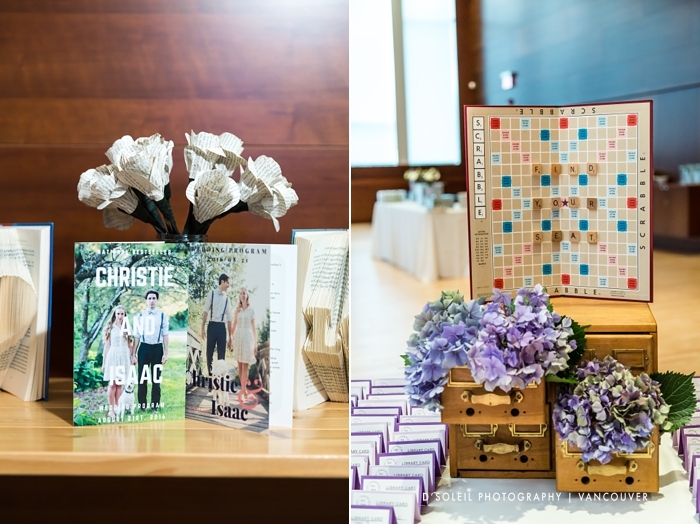 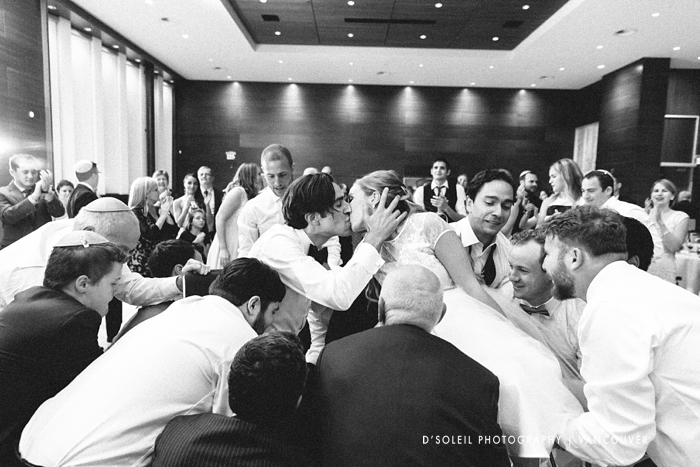 This summer, we had the privilege of photographing a Jewish wedding in Vancouver at Beth Israel Synagogue. 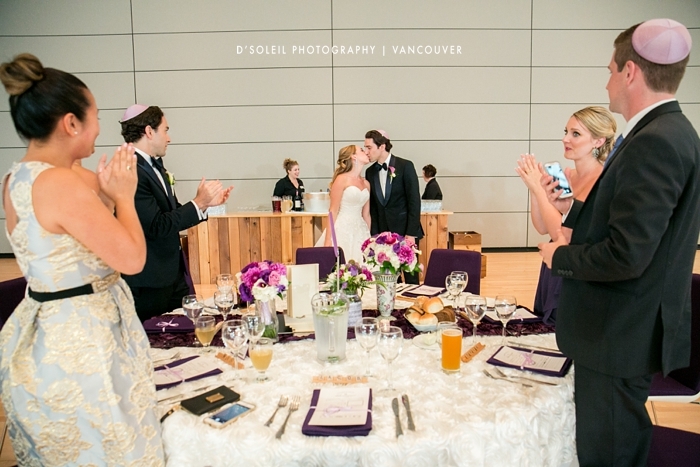 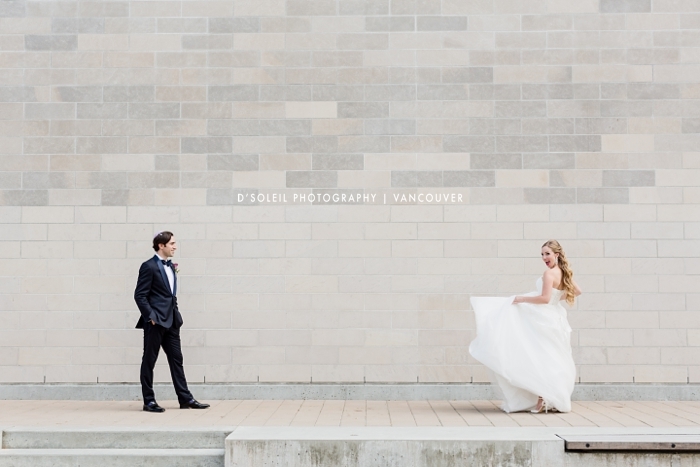 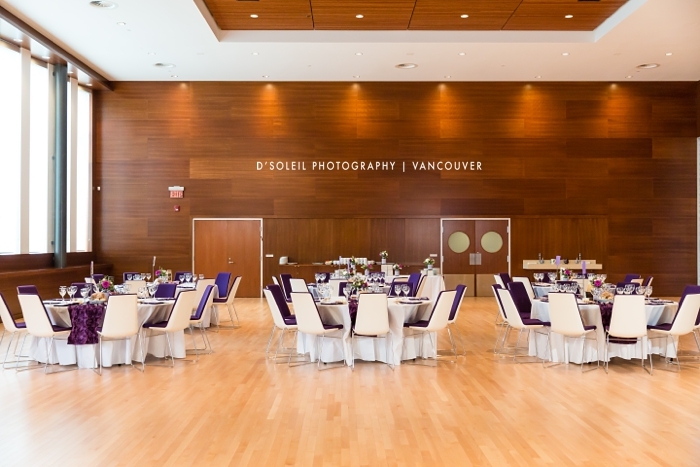 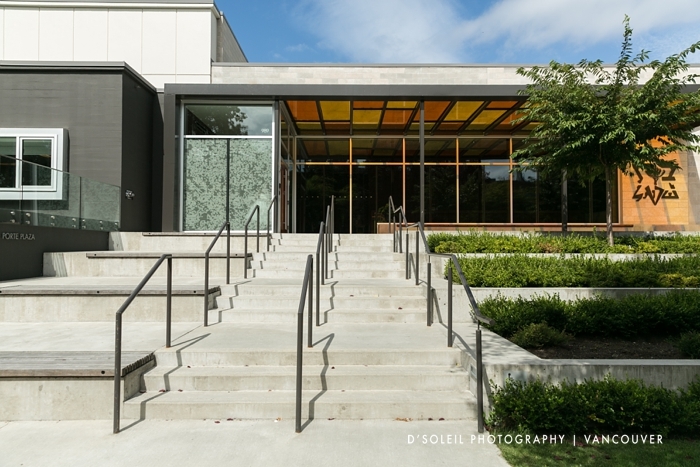 Christie + Isaac celebrated their wedding ceremony and evening dinner reception at this freshly rebuilt Synagogue on Vancouver’s west side. 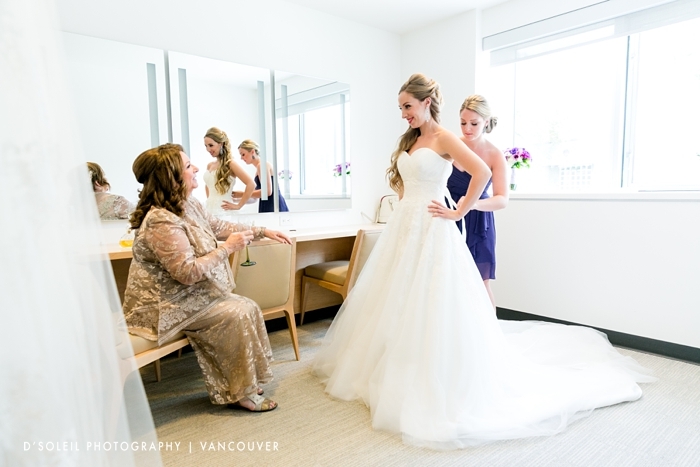 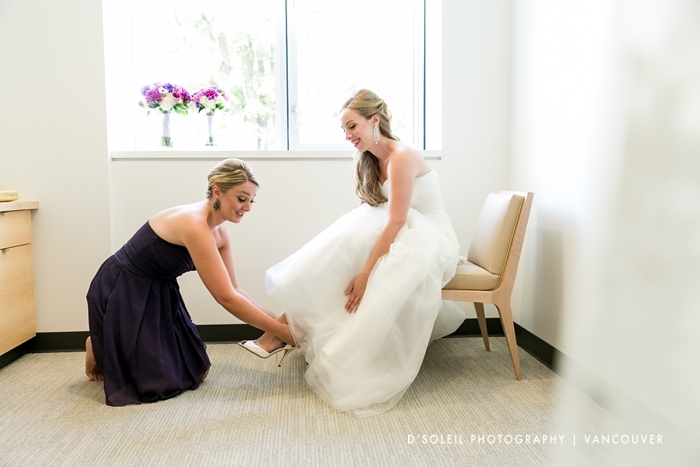 Christie started her wedding day with her mom and sister at Beth Israel Synagogue in their bridal room. 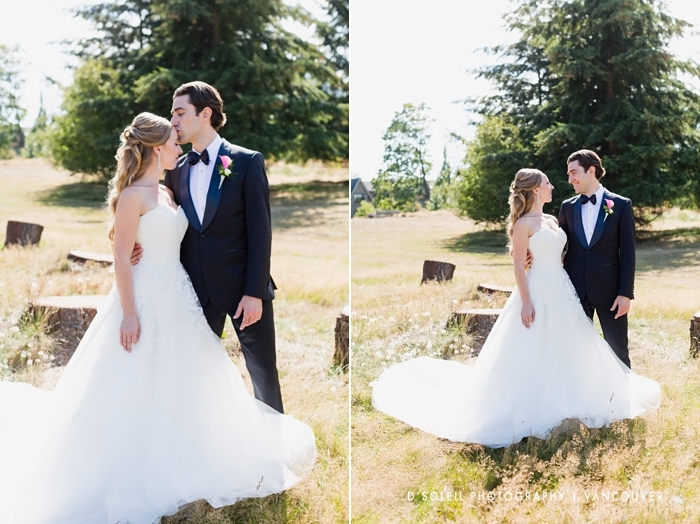 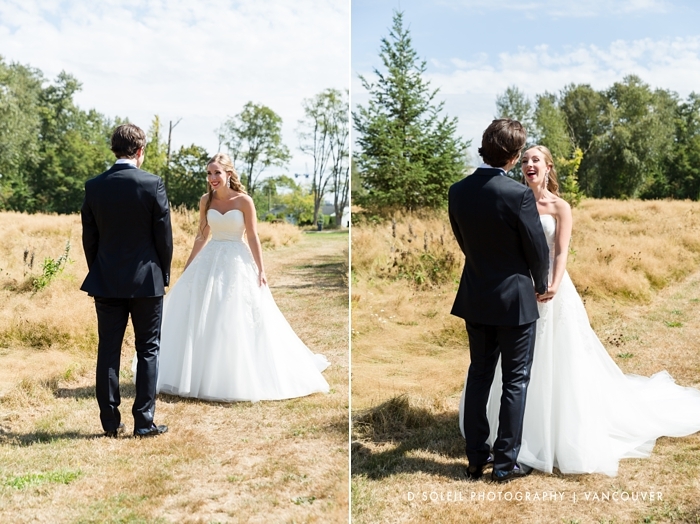 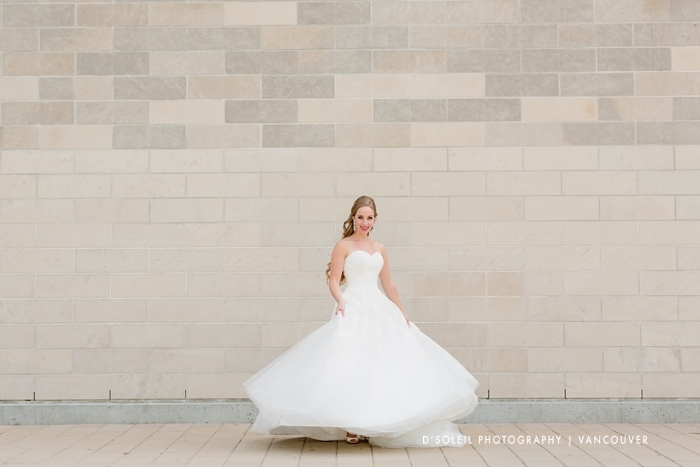 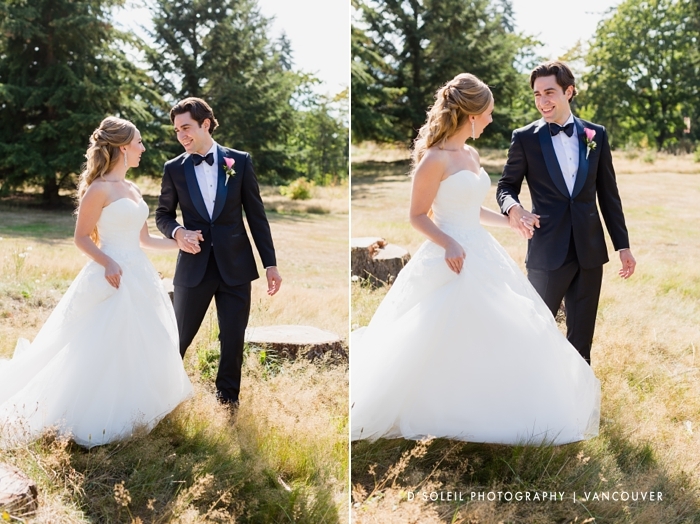 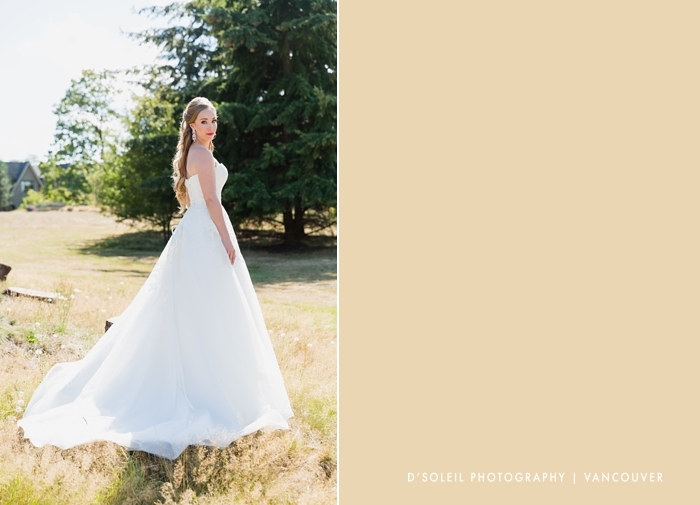 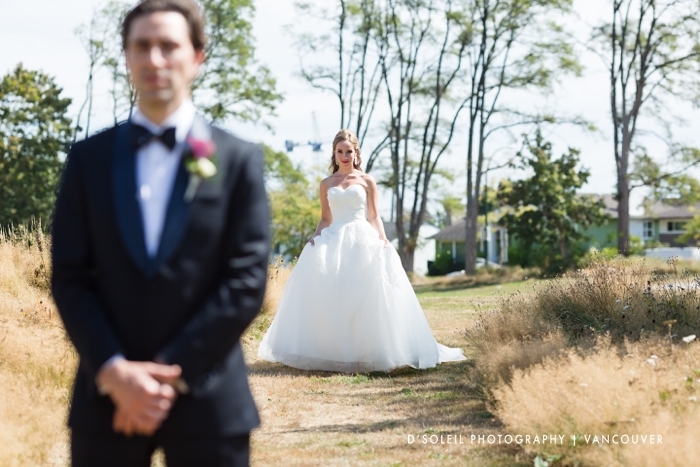 With help from her sister bridesmaid, she prepared for a first look a few blocks away at a quiet local park in Vancouver’s Shaughnessy neighbourhood. 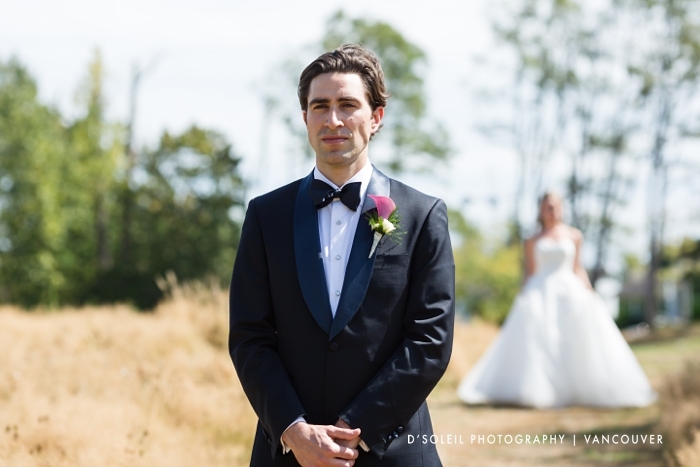 Isaac waited at the park for Christie’s arrival at the best first look location we identified them. 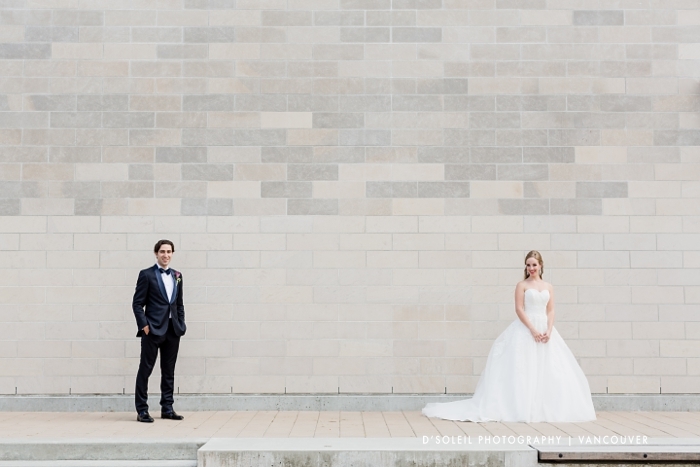 There, they saw each other for the first time that day, and as expected, they were both very excited to see each other formally dressed for their wedding ceremony later that afternoon. 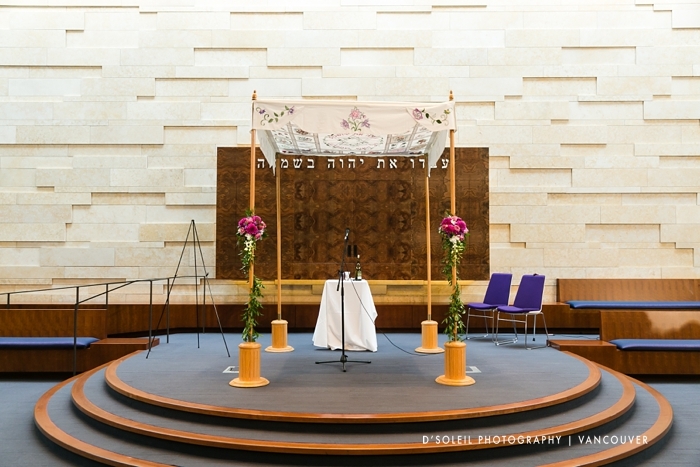 After taking photos at the park, we return to the Synagogue to prepare for the first part of their Jewish wedding ceremony, the signing of the ketubah. 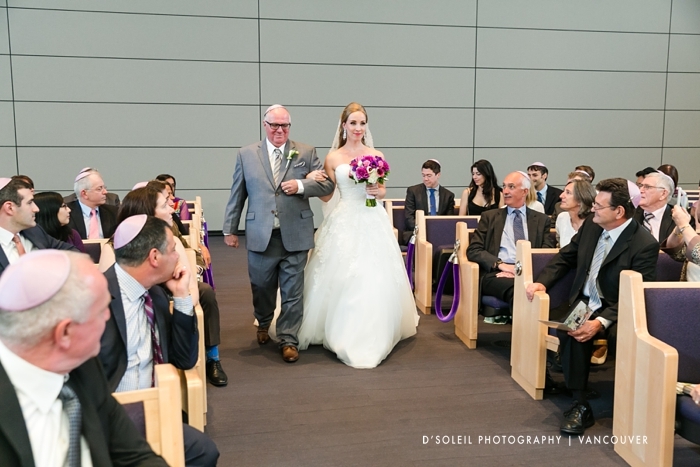 At the synagogue, we took a few more wedding photos around the new building before the official start to the Jewish wedding ceremony. 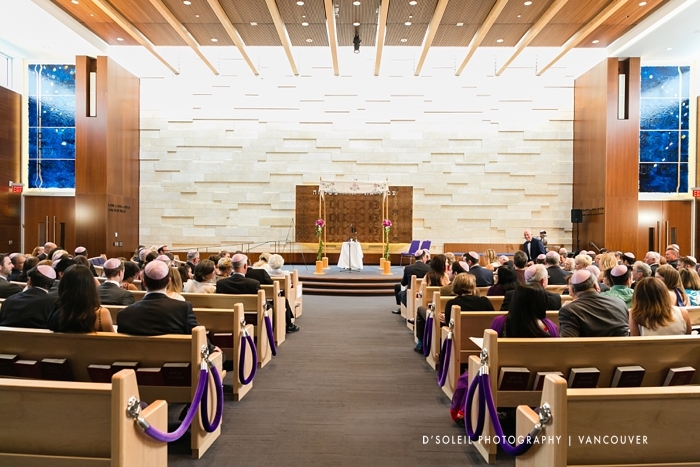 Inside the beautiful Synagogue sanctuary, the wedding guests await the bride and groom’s arrival. 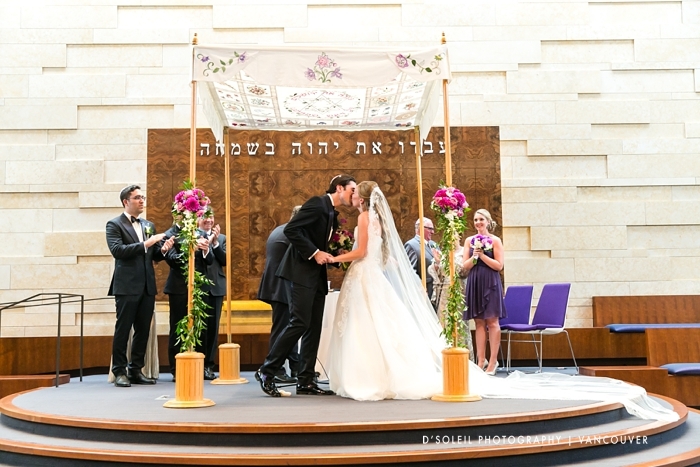 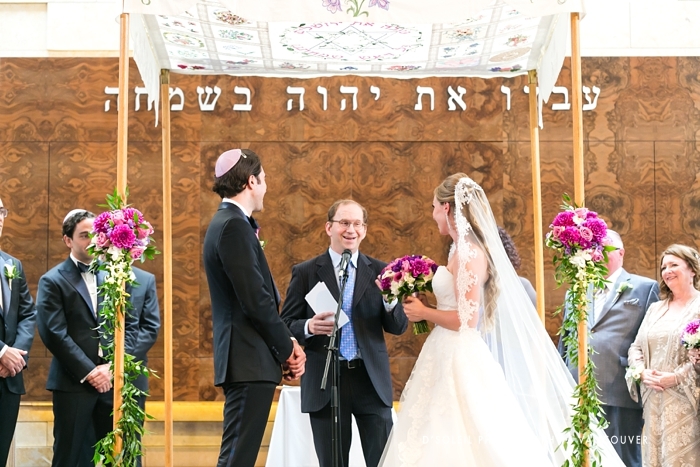 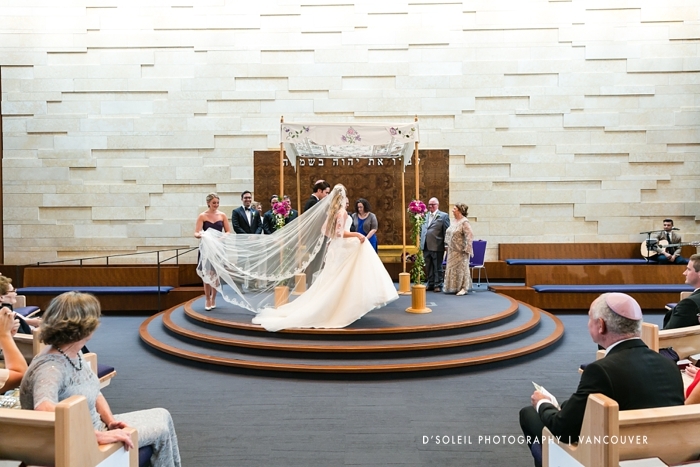 One of the things you’ll notice at a Jewish wedding ceremony is the chuppah, which is canopy that a Jewish couple stand underneath during the ceremony. 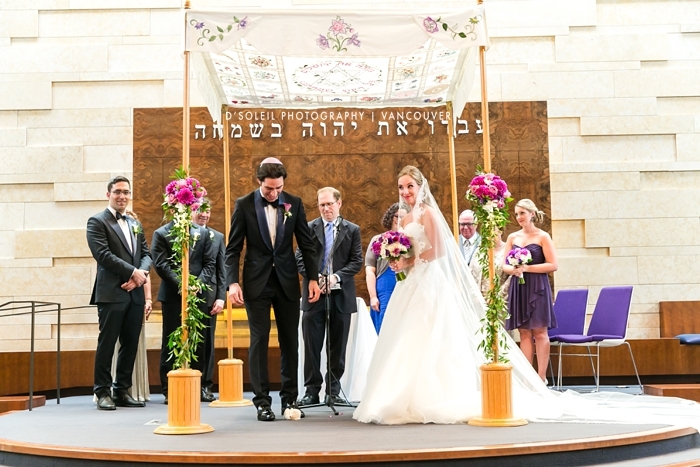 But before the start of the ceremony, the couple sign the marriage contract, called the ketubah, with their families and rabbi as witnesses. 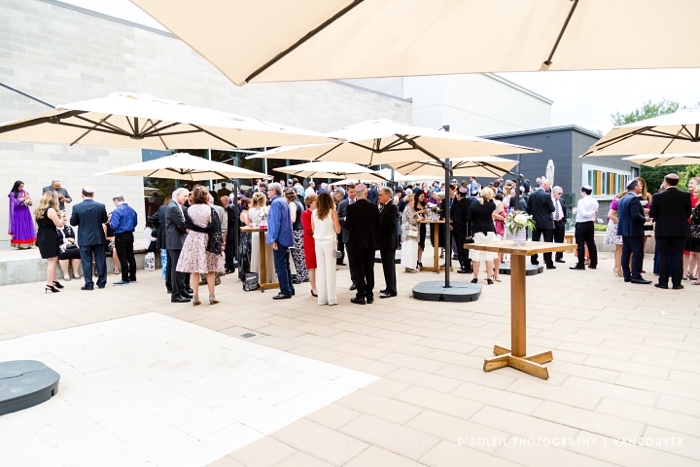 The guests then joined the cocktail reception in the courtyard while we took family photos following the wedding ceremony. 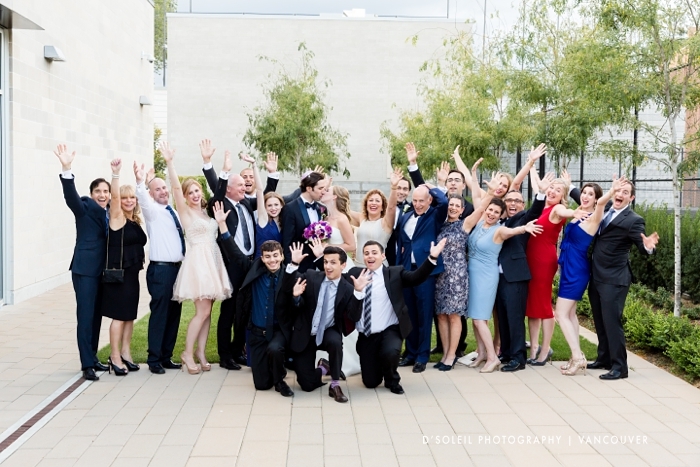 Despite it being summer, we received a little Holy rain during the family photo session. 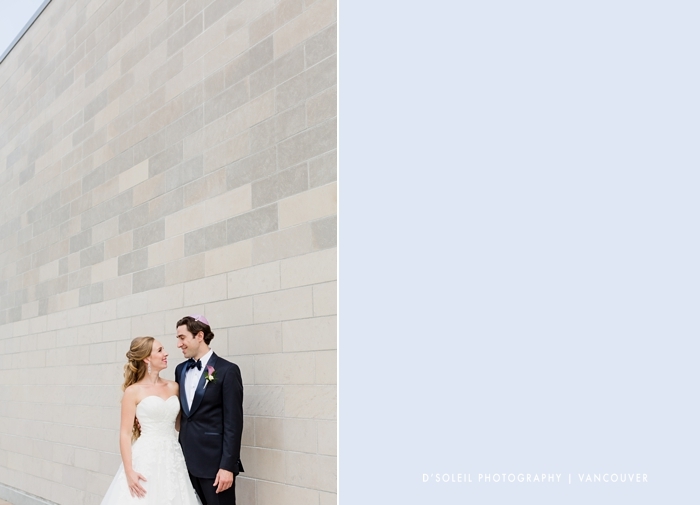 It was good luck because the rain didn’t last long. 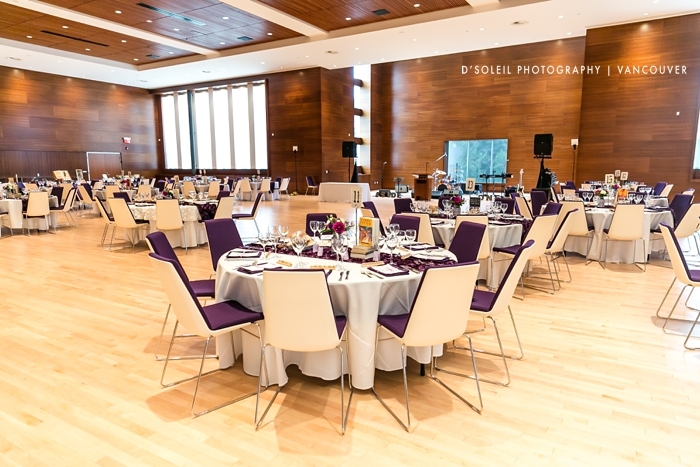 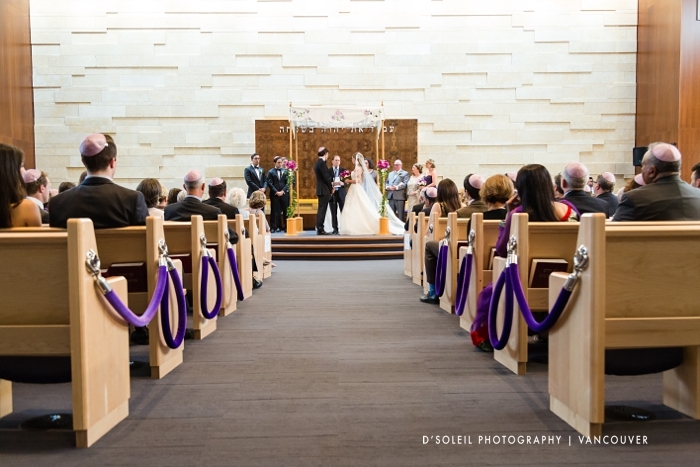 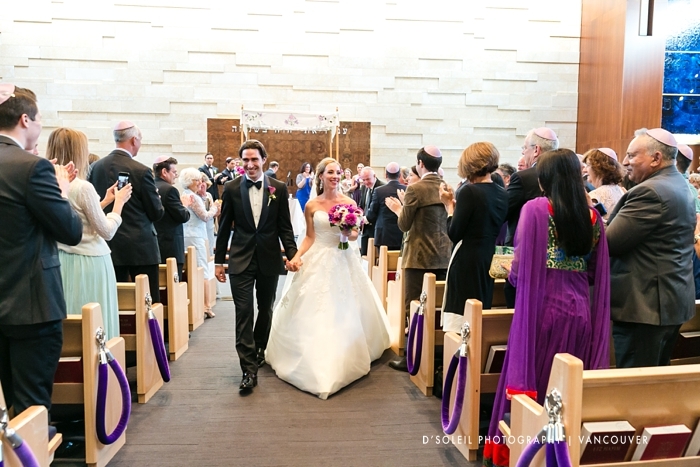 The synagogue has a large and beautiful venue space for wedding receptions. 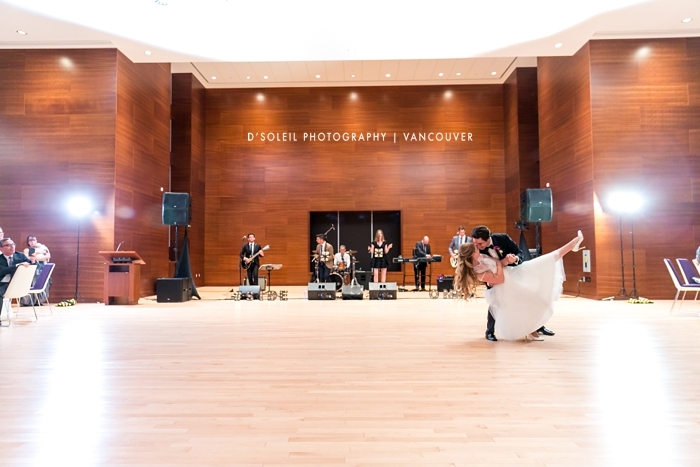 Enough to invite a few more hundred guests if they wanted to – but of course a large floor space was reserved for the dancing yet to come. 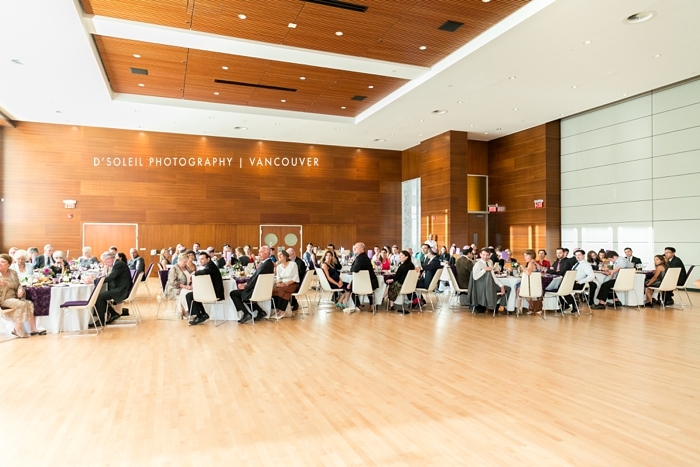 There were speeches and table visits throughout the evening. 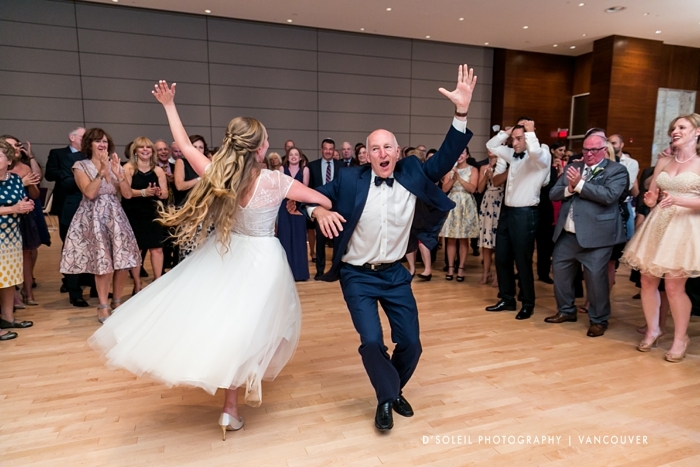 We loved capturing the candid moments throughout the evening reception. 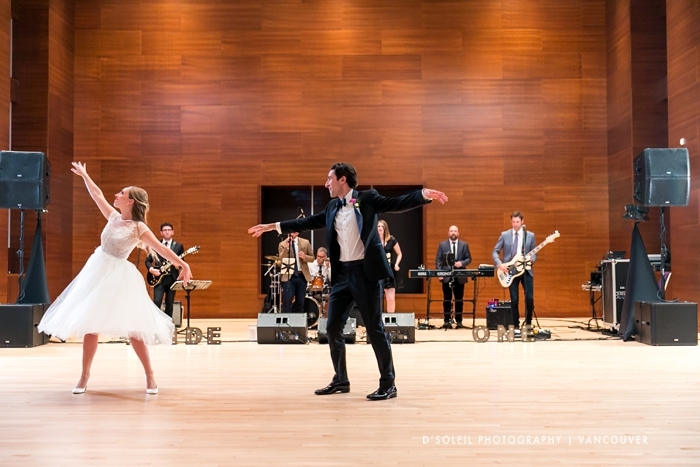 Then it was time for the first dance, no, not just any first dance, but a performance that put us in complete awe. 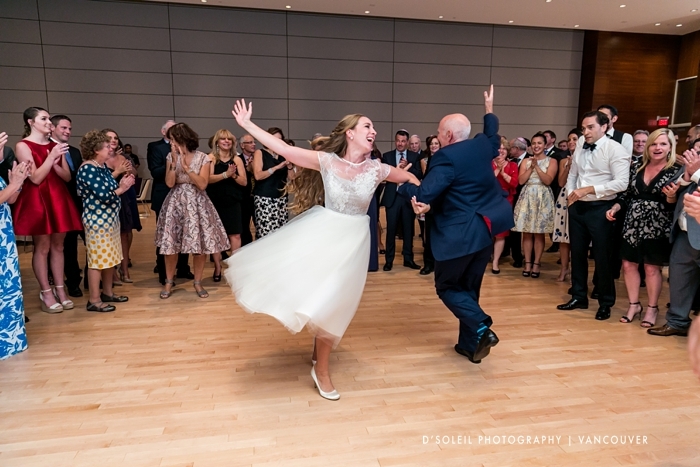 But our favourite part of the evening was the dance celebrations, also known as the Hora. 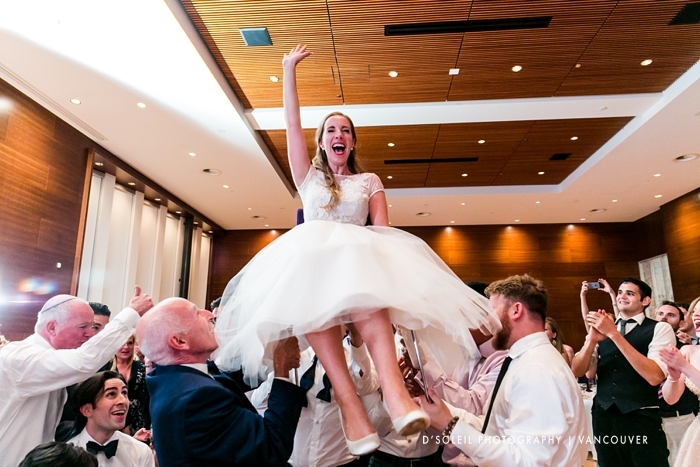 The best part of the Hora was the chair dance for the bride and groom. 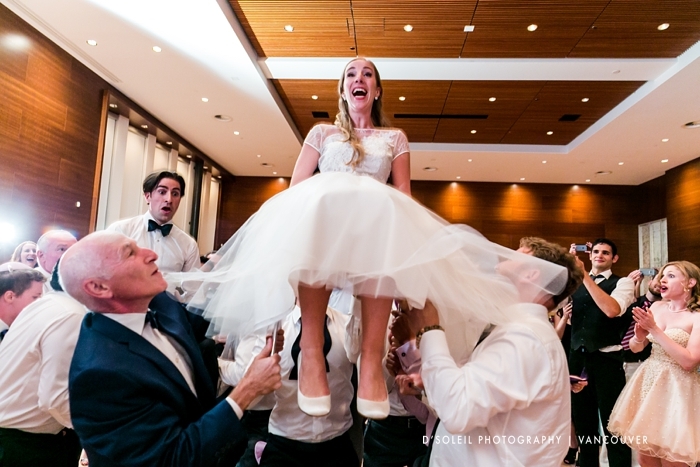 Their expressions of sheer happiness and fear all at once was priceless. 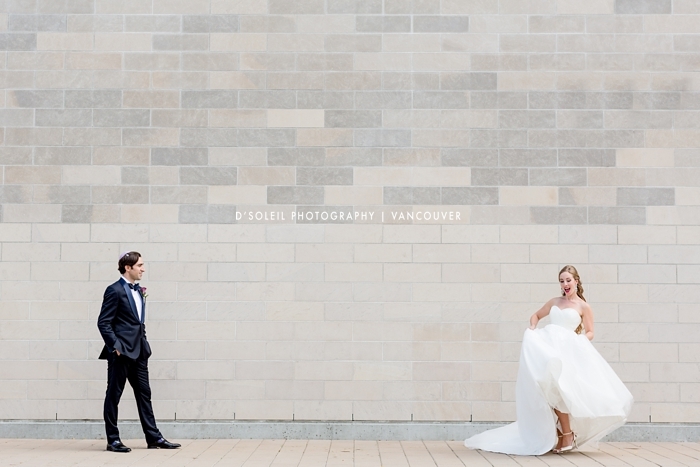 They are some of my favourite wedding photos of that day. 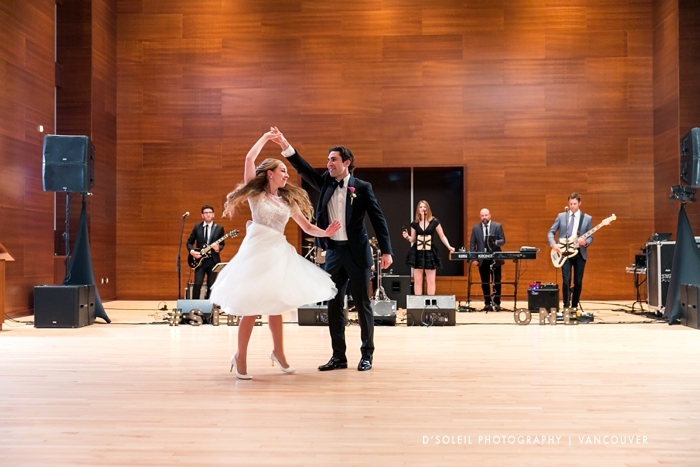 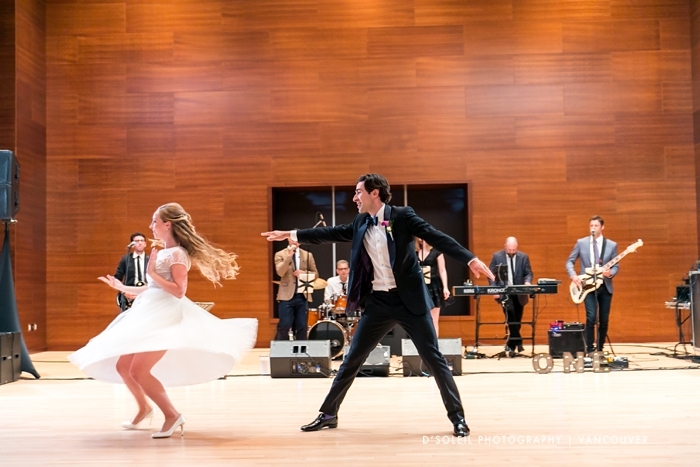 After the hora, Side One Band took over the evening festivities, shifting from Jewish dancing music to a number of contemporary hits. 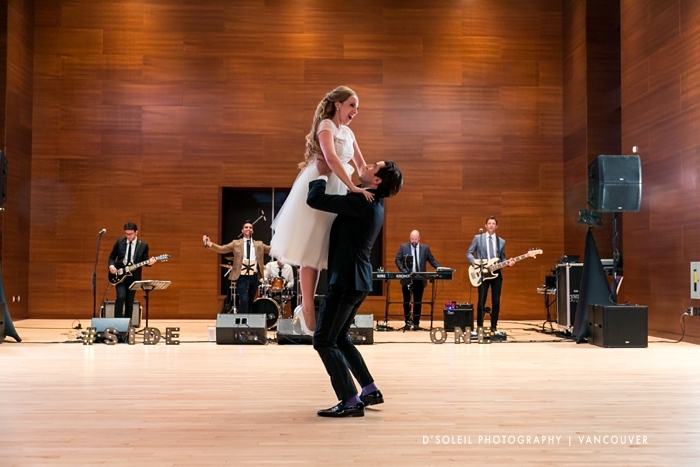 There is nothing like having a live band – it was incredible as always! 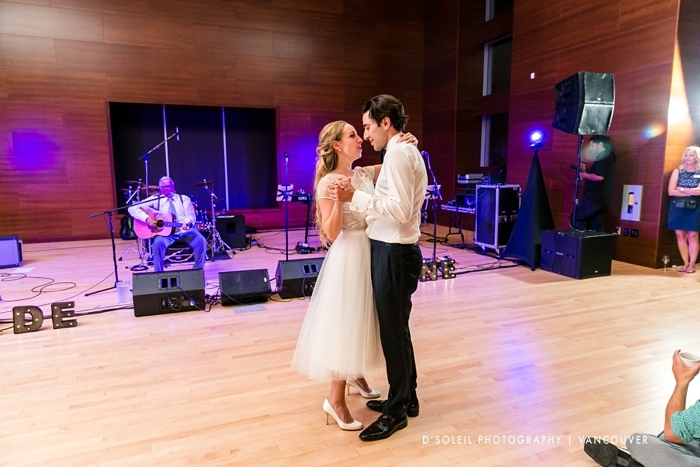 Christie’s father played guitar that evening as they slow danced their way into the latter part of their amazing wedding day. 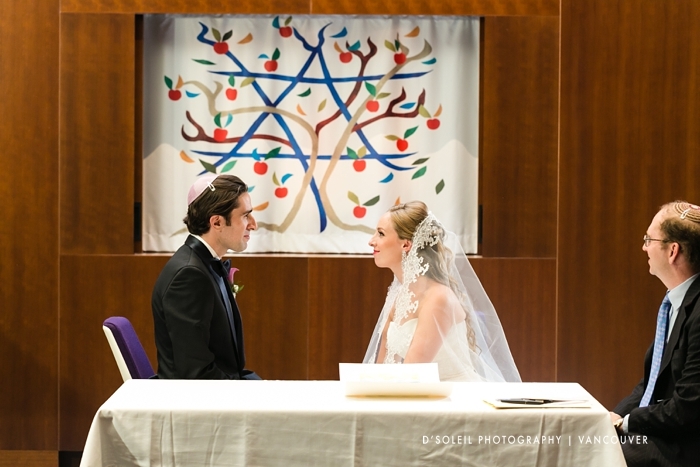 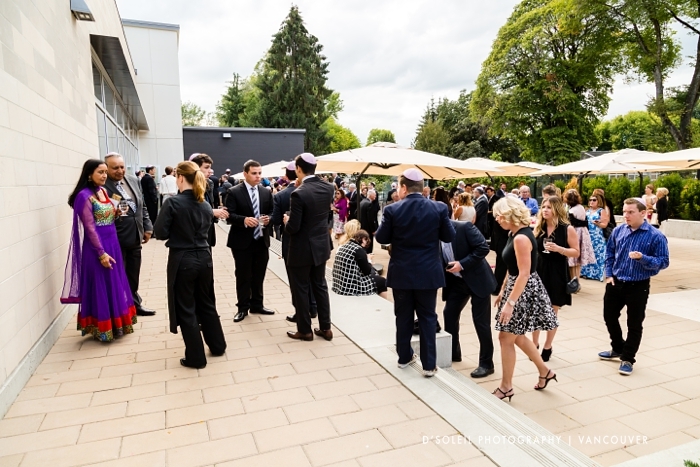 It was a fantastic experience and we hope to do another Jewish wedding again soon. 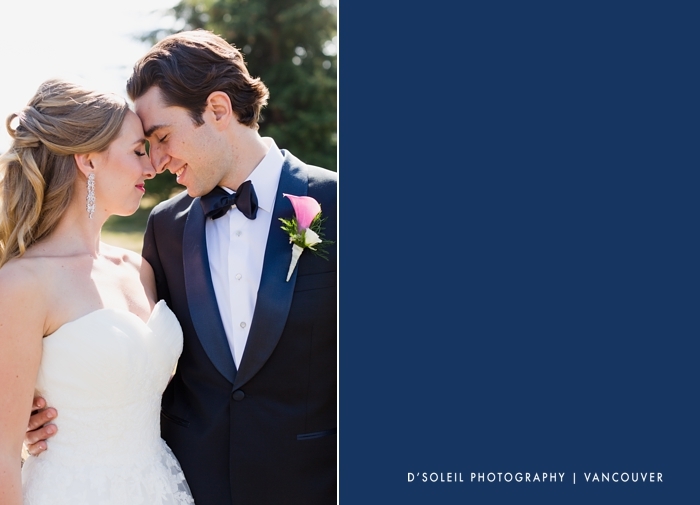 Congratulations again Christie and Isaac!